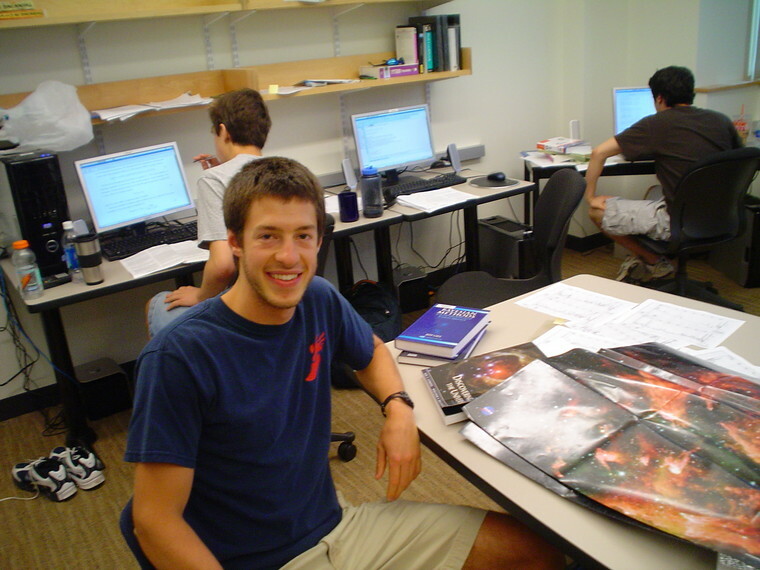 Greg Fullman '09 (Duanesburg, N.Y.), a physics and computer science double major, is spending his summer working on a research project that combines computer programming with cosmology, the study of the large scale properties of the universe as a whole. Whereas the average person admires the twinkling stars in the night sky for their beauty, scientists are often more interested in what they can tell us about our universe. Indeed, the light emitted by celestial objects, such as stars, can be broken into its constituent colors or spectrum and used to determine what these objects are made of, how hot they are, how fast they are moving, and a host of other important attributes. By studying the light from galaxies, stars, and other objects in space, scientists have made significant discoveries that have greatly increased our understanding of the universe. One such discovery came in 1929 when American astronomer Edwin Hubble used the spectra of a large number of galaxies to show that almost all of them appeared to be moving away from us. This phenomenon was observed as a redshift in the galaxies' spectra. As shown in a rainbow, visible light can be broken into several colors that range from red (long wavelength) to violet (short wavelength). When an object moves away from us, its spectrum gets displaced toward the longer wavelengths with the amount of this so-called redshift proportional to the object's velocity. Hubble first showed that the spectrum of almost every galaxy is shifted to the red, and that the farther away the galaxy, the greater the redshift. Since the amount of redshift told how fast the galaxies were moving away from Earth, he concluded that the further away the galaxy, the faster it receded from our planet. This relation – that a galaxy's speed is directly proportional to its distance – became known as Hubble's Law. Hubble's Law provided observational proof that the universe is expanding, and it helped lay the foundation for the Big Bang theory of the universe's origin. Because scientists believed the universe was made up mostly of matter, they predicted that gravity, an attractive force that pulls things together, would slow down the universe's expansion until it would eventually collapse in upon itself. In 1998, a team of scientists used type Ia supernovae, a certain type of stellar explosion, to chart the expansion of the universe. Type Ia supernovae are useful for determining astronomical distances because they are "standard candles," objects in space with a known luminosity (the amount of energy a body radiates per unit of time). When the scientists compared the observed luminosity of distant supernovae (which is fainter and redshifted) with their known luminosity, they made a shocking discovery: the expansion of the universe is accelerating rather than slowing down as had been previously predicted. To explain this acceleration, scientists have proposed that a hypothetical form of energy known as dark energy permeates all of space and tends to speed up the expansion of the universe. Current estimates state that around 70% of the universe is made up of dark energy. Type IA supernovae are extremely rare and identifying them can be an arduous, time-consuming process because one must analyze its entire spectrum to look for the characteristic patterns of its constituent elements. Assistant Professor of Physics Natalia Connolly has devised a more efficient way of finding supernovae that involves looking at only part of the spectrum and calculating the probability that it is a type Ia supernova using Bayes' theorem (a mathematical formula for understanding how the probability that a theory is true is affected by a new piece of evidence). One of the advantages of her method is that its probability calculation can accommodate relatively large uncertainties in measurements. Fullman is currently writing a computer program that will be able to perform these calculations. However, the process is quite time-intensive, with an average processing time of 17 hours, so a significant amount of his time programming consists of making the calculations as efficient as possible. He and Professor Connolly hope that this computer program will help extract information about the structure of the universe, and prove that her novel method of Type Ia supernova classification is superior to other techniques. Fullman originally became interested in the project after he took the astrophysics course taught by Connolly. He says that although the material was challenging, Connolly's energy in teaching the course led him to conclude that research in the field must be exciting. Because cosmology study depends largely on computing, he was also interested in the way it combined physics with computer science. While the learning curve for understanding the theory used to calculate a type Ia probability was quite steep, Fullman says that once he began to grasp the underlying probability theory involved, the method was quite intuitive. When asked if there is any added difficulty in programming due to the fact that some complex physics is involved, he replied simply, "Programming is programming. Once you understand what is involved in a calculation, you just use for-loops [a command that let's something be repeatedly executed] for integration and try to make it so single-step calculations can be done as quickly as possible." Fullman plans on continuing his current research for his senior thesis. When not investigating the ultimate fate of the universe, Fullman enjoys running and biking. He is a member of both the indoor and outdoor track and field teams. This is his third summer of research at Hamilton.